Get Your Best Bud The Premium Quality Shoes They Deserve By Pet Labs Today! Would you ever go out on a walk barefoot? Would you risk stepping on shards of glass, small rocks and other dangerous elements? Would you jeopardize your health by doing so while it's raining, snowing or is freezing cold? If you wouldn't do it, why should your best friend do it? That's right, they shouldn't - that's why we've designed these wonderful dog shoes that will protect their feet, much like your shoes protect yours! Offer Your Pet A Comfortable & Carefree Walking Experience! Thanks to their advanced design, these amazing dog shoes by Pet Labs are easy to put on and comfortably hug your pet's paws, offering them a safe and protected walking experience! In addition to that, they make your life easier as well, since you don't have to wipe clean their feet 3 times a day, especially during the winter; you simply remove their shoes before you let them into the house! Just remember to measure your dog's paw using the detailed size chart in our pictures, to be sure that you get them the right size! In such a wide and demanding market as pet care accessories, using premium quality materials is not an option; it's an obligation. 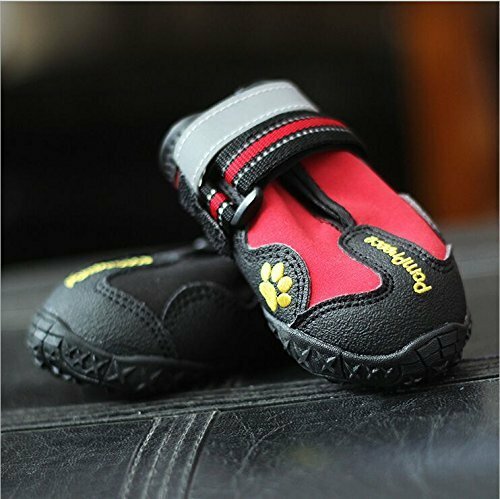 Our dog shoes are made of water resistant, heavy-duty material with an anti-slip, sturdy rubber sole that will protect your dog's paws from harm and they also have reflective velcro straps that will allow you to see them even during the night! Order Your Own Pack Of 4 High Quality Pet Shoes Now - As Long As Our Supplies Still Last! High Quality Rubber Sole ensures good grip on most surfaces. Excellent for protection agains the elements and dogs with sensitive paws and allergies. Shoes are very flexible so they conform to the shape of your dogs paw making it a more comfortable walking experience. PLEASE MEASURE your dogs paw. The size chart is located in the pictures to the left. View More In Paw Protectors. If you have any questions about this product by Pet Labs, contact us by completing and submitting the form below. If you are looking for a specif part number, please include it with your message.